Hey Yogis – watch that weight! Interesting turn of events … it is the time of year that we (you and me) tend to overdo the food and drink thingo. Weight gain is one of the downsides of this. I read about how we must practise moderation etc. and continue with our exercise regime (if we have one) and it might not happen! Well, let me tell you it is not that easy. I have some tips that may help if this concerns you. The 80/20 plan is fairly easy to stick to – i.e be good 80% of the time and indulge 20% of the time – this works on a weekly, daily or even a meal by meal basis. From my grandmother I learned to refuse (politely of course) second helpings of any food – that goes for salads as much as icecream. Small plates are an excellent idea; helpings are automatically smaller. Focus! No eating and watching television or reading … Zen wisdom: “With your full mind you form the mudra in your hands … when you sit, you will sit … When you eat, you will eat. That is all” (Shunyryu Suzuki). You can only try it and see how it works for you. Mind you, I think friendly conversation is good at meal times. If you can maintain your physical exercise that is wonderful! I find that if I get out of bed in the morning and straight on to my Yoga mat – I don’t give myself a chance to think, ‘not today … ‘ It works for me! 15-20 minutes is all that is needed to energise for the whole day! Start with stretches and move on to asana – you’ll find 20 minutes is easily filled. The Five Tibetans give you a real boost too. Drink plenty of water! Soft drinks and fizzy drinks in moderation. I hope this is useful to you! It works for me and my weight has remained fairly constant for the last few years (since menopause …) and this year, since I gave up dairy, it has dropped a few kilos. I read the book Whitewash by Joseph Keon that’s enough to put anyone off milk! I don’t know if it is that bad in Australia but I’ve felt so much better since giving up dairy – and I don’t get as much hay-fever. I confess to still having a slice of strong cheddar when the mood takes me! (I think I crave the salt). I hope you have a wonderful time over the silly season and an excellent 2012. After dropping the LBD (little black dog) off at the kennels in Lake Clifton, we headed for Donnybrook on the SW Highway and stocked up on provisions for our stay in Nornalup. Since we were last there, an Antique Shop has opened right next to the fruit & vege shop! I am a sucker for antique/junk shops but on this occasion I didn’t buy anything although I was tempted. Next stop, Bridgetown (also known as Fridgetown in winter). Between Balingup and Bridgetown we could smell the smoke from the out-of-control fires at Nannup. 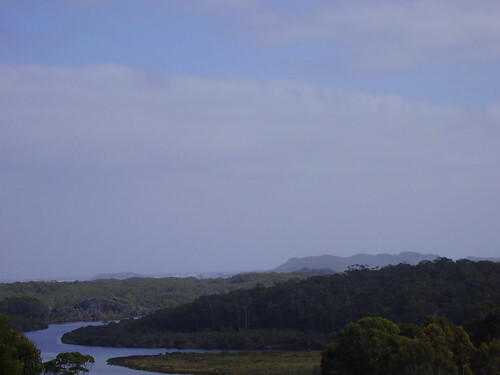 This is a beautiful part of South Western Australia but so susceptible to fire. Bridgetown was nearly wiped out in 2009 but has made an amazing recovery. On the journey down south we saw few dead ‘roos by the side of the road – not as many as usual, probably because the rains have been good so the animals are not browsing on the road verge. You can smell the dead animals long before you see them. We also saw some squashed snakes and some unidentifiable birds. One live monitor lizard ran across the road in front of us – we were lucky not to hit it. I always thought these reptiles were very big skinks but apparently they are monitor lizards. I can’t remember the proper name. The road from Manjimup to Walpole winds through the forest. The light flickers through the trees and that makes me very sleepy. Roland drives this bit now – ever since the time (times) I’ve fallen asleep at the wheel and nearly ended up in the trees or worse. Rooney’s Bridge over the Warren River is a nightmare spot for me – I was nearly wiped out by a logging truck there once. The narrow bridge is situated on a dog-leg corner and there is nowhere to run if a truck comes down the middle of the road. Strange how the temperature drops as you near Shannon. Shannon used to be a timber town but was all but destroyed by fire many years ago. Now, there is a camping ground and toilets – that’s all. The blue wrens were in abundance at Riverside Retreat. How beautiful they are – sapphire blue (males) and pale blue/grey (females). They are very small and fly close to the ground feeding on insects. They are like sparkling jewels in the sunlight. In the evening, wild mallard ducks came to the verandah door hoping for some food. I couldn’t resist and the bold creatures took food from my hand! The second morning, there they were waiting by the door for a hand out! The trouble with ducks is the mess they make – and if you step in it, it sticks to your foot like glue. End of feeding the ducks. I saw rabbits and evidence of the roos that live in the bush surrounding Riverside Retreat but only caught a glimpse of one, one evening – like a grey ghost in the trees. Christmas @ 139 phoned me and I’ve placed my order for the silly season (and I do feel really silly about it). Anyhoo, I think my grand daughters will enjoy the ornaments! view from Nornalup, a photo by Eleanor V on Flickr. From the hill above Nornalup, looking out over the Frankland River toward the Great Southern Ocean. Peaceful Bay/Walpole, a photo by Eleanor V on Flickr. 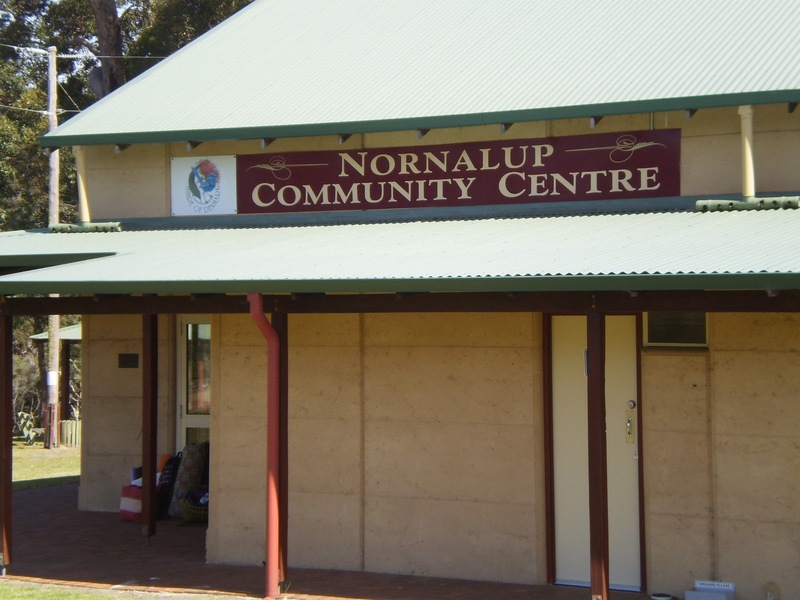 Nornalup, a small jewel on the Frankland River. 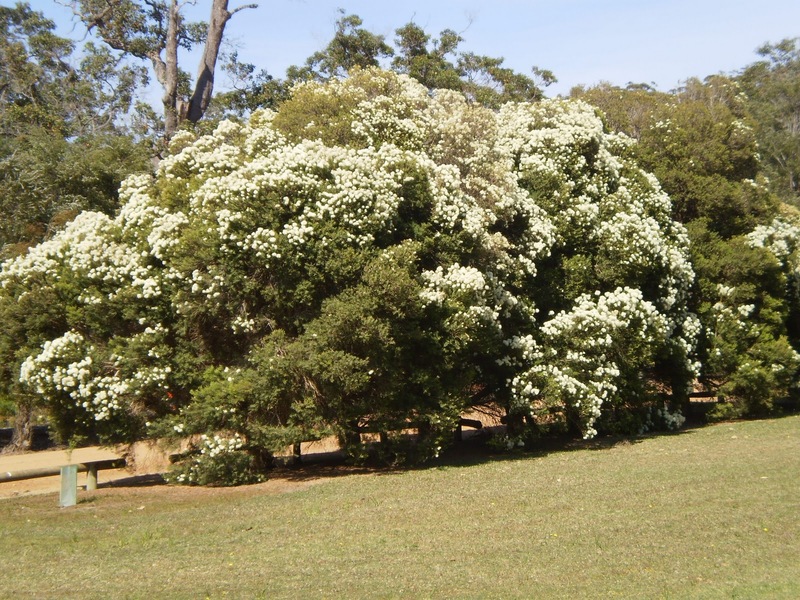 It felt like we were coming home as we drove through the forest between Manjimup and Walpole. I felt quite teary and was pleased that Roland was driving. 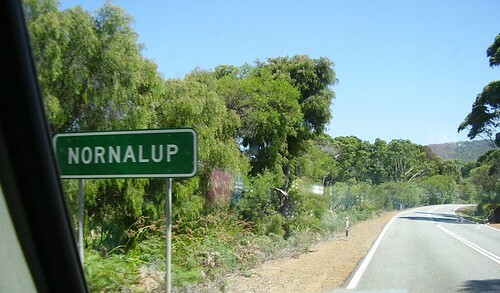 We didn’t stop in Walpole but went straight through to Nornalup – to Riverside Retreat. What a lovely place! 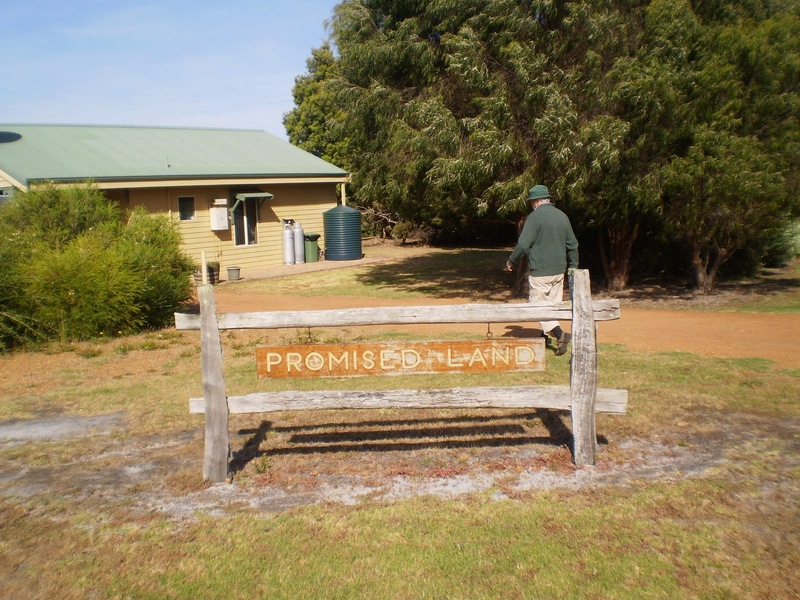 Margo and Don Redman made us so welcome and showed us to our chalet “Promised Land” – the very end chalet with beautiful views across the Frankland River to the forest beyond. Promised Land is named from a story from the Goldfields around Kalgoorlie in Western Australia. At Riverside Retreat all the chalets are named for places or incidents in Western Australia and all have a story to tell. Promised Land turned out to be a comfortable, well supplied little home with most mod-cons including air conditioning. There is no signal for mobile phones at Nornalup so the peace and quiet was lovely. Occasionally we could hear traffic on the South Coast Highway but it was never intrusive. The weather was clear and with no light pollution (apart from the waxing moon) the starry sky at night was amazing. It was quite windy but that did not deter Roland from fishing in the Nornalup Inlet. He loves to wade and there is a small jetty from which he could set off up or down the Frankland River. In the event he put back all the fish he caught – which is what he usually does – probably because he doesn’t feel like cleaning them! On two evenings we ate at the Nornalup Tea House which is a lovely old building next to the Highway. Emma and Brett made us very welcome – both of them are Yoga students who often came to class when I was teaching there. The food is fabulous and the service is too! Amazing to find such an excellent restaurant out in remote Western Australia. The secret is possibly that Brett uses as much local produce as he can and the wine is Western Australian too. When my friends heard I was coming down for a visit there was no doubt that I would take a Yoga class for them! 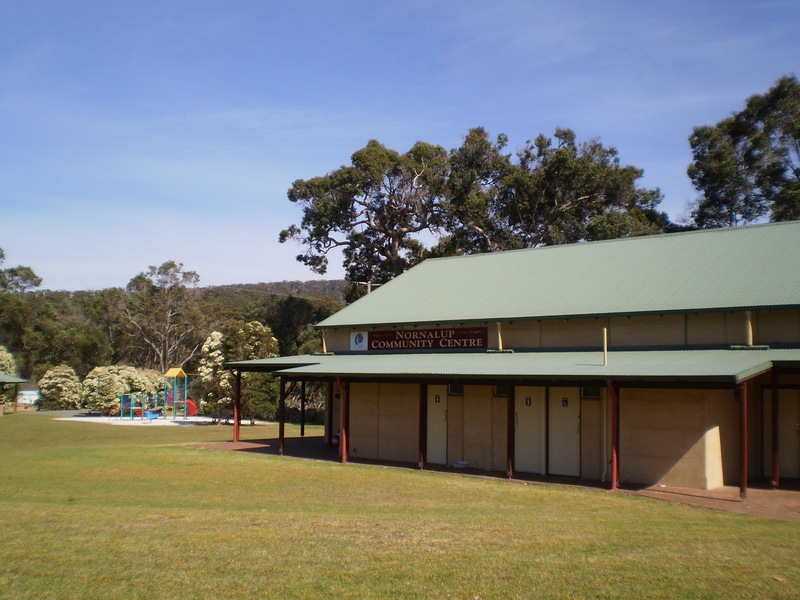 So on Saturday morning at 9.00am in the Nornalup Community Centre we all came together to share some Yoga! As I was doing the ‘welcome‘ I looked at all their dear faces looking at me and teared up so that I could hardly speak! In the event it was more of a workshop than a class and I remembered how delightful it is to teach in country town! Each person was so receptive and I feel I learned far more than anyone there – such is the nature of Yoga. I’ll add some more tomorrow – there is a storm brewing here and I want to turn off my computer now! Yes, we will be back!